You can close your eyes and almost see the musicians playing their hearts out right in front of you and that honesty is palpable in every single track of the album. Some years ago I came across a debut album that, together with wooing me, changed too my by then narrow vision of what progressive metal really is all about, and therefore, in what direction it is moving forward nowadays. A couple of weeks ago I had the pleasure to receive the band’s second album and from the hands of the mastermind himself; a man that I consider one of the future legends of progressive rock. Paradigms, by Semantic Saturation; is out now and I couldn’t be any happier about it. Semantic Saturation is a progressive rock/progressive metal project founded in 2010 by Canadian guitarist Shant Hagopian, a man whose musical vision I personally find outstanding, and an artistic sense that, as an amateur musician, makes me sort of “jelly”. 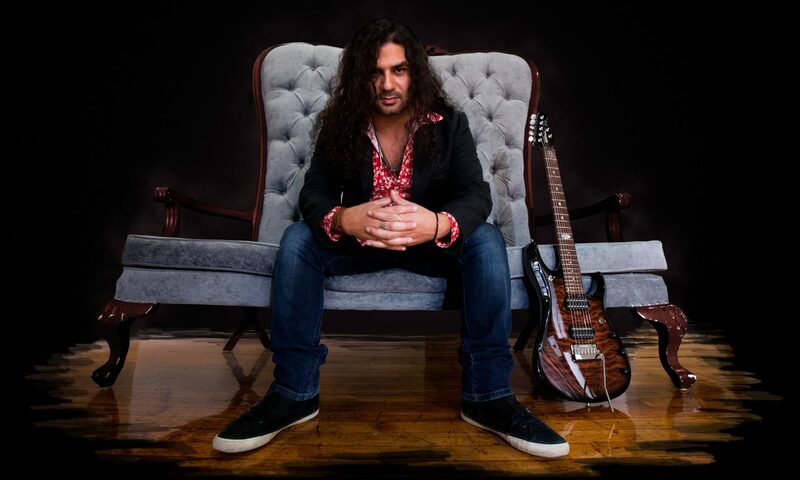 Besides being an outstanding guitar player himself, Shant has always taken good care on finding great musicians to interpret the rest of the instruments on his albums. In fact, he affirms that the idea to work with a different set of musicians on every album is one of the bases of his project. Paradigms features renown musicians such as drummer Craig Blundell and bassist Kristoffer Gildenlöw throughout the whole album; and counts with the participation of special guests such as keyboardists Derek Sherinian and Alex Argento, and singer Houry Dora Apartian. But let’s go back to the music itself. Though heavily influenced by his jazz background, Shant works hard to never stay in one place in terms of style. He wanders through different musical moods that are evident throughout the album and leave the listener feeling fulfilled, and recharged. Both, this and the previous album, give one the idea that the artist aims to starts musical concepts for each album from scratch and enjoys surprising his fans with unexpected roads. A visionary musician that is not only focused on impressing us with his mad skills, yet he is willing to transmit and let us “feel” himself and the rest of the musicians in his songs. Every track delivers a piece of his own soul, and the heartfelt interpretation by all allow us to feel related to what we are listening, to recognize each of our own emotions on those melodies, those notes, without the need for words. The songs tell stories as clear and sincerely as words could, and sometimes even better; something that many virtuosos have sadly forgotten when aiming merely to break speed records. First track Mirrors of Confusion builds up the level of energy with one of the most vivacious funky guitar riffs I’ve heard lately. Carrousel of Death comes heavier, bringing a great display of jazzy melodies, a truly entertaining track to which you just can’t simply stay unresponsive. Since here the evidence is clear. Everything on the album flows smoothly; in one word, delightfully. Empty Whisky Jar, as the name may somehow reveal, is a slow-paced and melancholic track that happens to feature the mesmerizing voice of singer Houry Dora Apartian, doing some kind of smooth jazzy improvisation, that transmits such raw energy that it’s hard to believe it is a recorded sound. Some soulful guitar solos make of this track one of my favorite in the whole album. The progressive vibe grows strong in the next track. The Stranger from Andromeda features some really cool sounds effects and luscious thrilling guitar riffs and solos. Until We Meet Again is to me the most relaxing track in the whole album. Derek Sherinian keyboard work shines exceptionally throughout Ulterior Harmony, a track much more energetic than the previous one, the virtuoso’s great work intertwines with Shant’s guitar creating some kind of cool proggy riff off that leads to a great display of both, neat technique and soulful interpretations. Disturbance Within is a trippy, heavy yet slow-paced rock piece, that right after transforms into chaos and rage. Universal starts with a lonesome and gloomy keyboard that evolves into another rich progressive rock track. Another laidback track that besides changing the mood once again, also briefly features a harmonica interpreted by Shant’s Wife, Nanor Wazirian. Finally, Where Dreams Have Died, is the longest one in the album, and maybe the most complete in terms of styles. It has unsuspected changes coming all through while keeping the fluency, delivering heavy riffs in between its beautiful chaos. By the way; those bells ala Super Mario Bros at the end… Brilliant. To conclude, it’s undeniable that Shant has the rare ability to transport you to your deepest emotions with his compositions and his playing. Paradigms has the raw vibe of smooth improvisation yet feels also completely professional and neat. You can close your eyes and almost see the musicians playing their hearts out right in front of you and that honesty is palpable in every single track of the album. For a progressive rock/progressive metal fan, Paradigms is a must have; for a jazz fan, a refreshing musical treasure; for anyone with working ears, an interesting finding and door to the modern progressive genre.